Cut the Rope: Time Travel is the sequel to Cut the Rope , a game in which you guide the sympathetic Om Nom through a series of levels where the only goal is to shovel as much candy as possible in her mouth. The gameplay in this new version is almost identical to the original, and your mission is always to send three sweets that appear in each level in the mouth of Om Nom . However , this time , with the addition of time travel , the task becomes a little more complicated puzzles become more interesting . 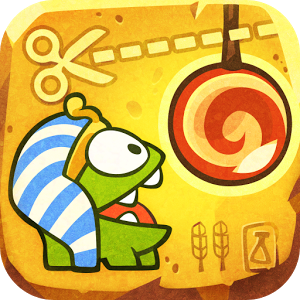 In addition to new puzzles, which now includes a series of new elements such as helices , chains, bombs and portals; Cut the Rope: Time Travel also allows players to visit six new historical periods more interesting : the Renaissance , the Middle Ages , the era of pirates, Ancient Egypt , Ancient Greece and the Stone Age . Each period , of course, has its own characteristics . Graphically, Cut the Rope: Time Travel maintains the same quality as its predecessor. In fact , some of the animations are even made ​​with more care, which gives excellent images.